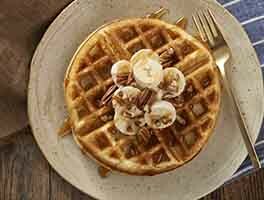 These cornmeal waffles are good if made without the spices and eaten with syrup, but even better made spicy and served with a simple chili con queso dip. 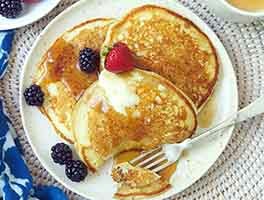 Leave out the optional ingredients if serving the waffles with berries, fruit compote, or syrup. *Use the trimmed white and 2" to 3" of the scallions' green part. 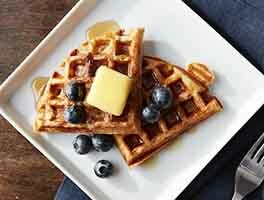 To make the waffles: In a medium-sized mixing bowl, whisk together the buttermilk, eggs, and melted butter or oil. 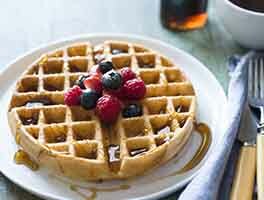 Drop the batter by 1/3-cupfuls onto a hot waffle iron, and cook it until steam stops seeping from the iron. To make the chili con queso: Heat together, over low heat, the salsa, cream cheese, and grated cheese, cooking and stirring until the mixture is smooth. Stir in the chopped spinach and scallions. Serve in a fondue pot or chafing dish alongside the waffles; the chili will thicken as it cools. Any leftover chili con queso makes a wonderful dip for tortilla chips, or spread for a wrap sandwich. Best with the egg whites beaten and folded into batter. Wonderful whether you make a sweet or savory version. Great crunch and they freeze so well. Often we top ours with chili and a fried egg. 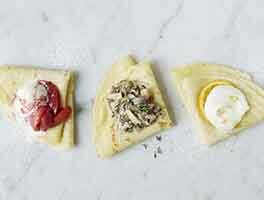 This morning we had a sweet version topped with whipped cream cheese and blood orange curd. We love these waffles. When we want a waffle that's sure to come out crunchy and tasty, this is the go-to recipe. It's easy to follow, the waffles come out perfectly every time. I don't typically use buttermilk, just regular milk or a milk/yogurt blend. I also don't do the savory waffles. But, no matter, they're delicious every time. Just made these waffles without the spices for breakfast, and they turned out wonderfully. Letting the mixture sit made for subtler texture and good taste. Great with syrup and tart yogurt. Unlike waffles made exclusively of AP these don't collapse when re-heated so they are perfect for freezing to enjoy during the busy week. These are very tasty made as directed but for additional sour notes that seem to go very well with the corn substitute 1 cup of sourdough starter for 1 cup of the buttermilk and reduce the flour to 1 cup. I used unfed starter and kept the chemical leavening, but you could certainly try feeding your starter and use no additional leavening at all. These were tasty. I made them without the spices and we enjoyed them. I only got 3 out of my 8 inch Belgian waffle iron, though (Presto "Flip-Side" Iron). We had this for breakfast without the Mexican spices and cheese. I used White Flint Stone Ground Corn Meal, (nice crunch) and I used only one tablespoon of sugar. Instead I added one teaspoon of vanilla and an extra half teaspoon of salt. A declared winner! We will make this one often I am sure. And we are looking forward to trying it as written with the Mexican spices and cheese. If you want a cornbread flavor to your waffles these will fit the bill. I made them to go with fried chicken, bourbon maple syrup and bacon. I used masa, and no spices. They smelled awesome while cooking, but came out floppy and flat, (maybe it was the masa). I think I prefer big, fluffy and traditional waffles with fried chicken, where there is more contrast of texture and taste. I am recommending this recipe, because I think they would be fine for another use.